This study is a collaboration by security researchers from India, the United States, and the Netherlands. Hari K. Prasad, who organized the study, is a Hyderabad-based technologist working at a research and development company. 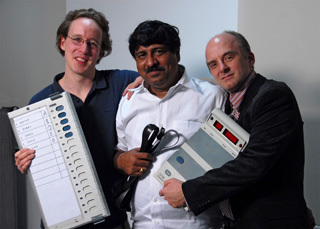 In 2009, the Election Commission of India publicly challenged Prasad to demonstrate that EVMs could be tampered with, only to withhold access to the EVMs at the last minute. Dr. J. Alex Halderman is a professor of computer science at the University of Michigan. A noted expert on electronic voting security, Professor Halderman demonstrated the first voting machine virus and helped lead California's "top-to-bottom" electronic voting review. He holds a Ph.D. from Princeton University. Rop Gonggrijp is a technology activist from Holland who was instrumental in having EVMs banned in the Netherlands. In 1993, Gonggrijp cofounded XS4ALL, the first ISP in the Netherlands to offer Internet service to the general public. Scott Wolchok and Eric Wustrow are student researchers at the University of Michigan. Arun Kankipati, Sai Krishna Sakhamuri, and Vasavya Yagati are engineers at NetIndia.